Bishnu Rimal's Website » Blog Archive » Dear GEFONT: Goodbye! Competition takes place normally among those who think themselves are qualified and competent. Whoever wins will be the leader. And, those who do not win should wait for the next time. This is the established norm. It does not sound logical if those who cannot make this time start making discounted comments and feeling depressed. Such attitude does not look healthy even for those who display it. It is said — “If you want something you’ve never had, you have to do something you’ve never done.”Therefore, whether you do not go for a competition, else, be ready to accept the result whatever it comes to you. At a time when I am biding you all my goodbye from the leadership of GEFONT, I had expected a different feeling than what I am showering with now. But expectations cannot be comprehended always. While I was leading you and the trade union movement, I might have sounded vocal and demanding. My words might have been shrill for someone, and at the same time, they might have sounded pleasant for some others. But all I did this was not for me to please my palate. It rather was for the interest and benefit of all us, and, more than that, it was for the trade union movement that we have been part of. I have never disillusioned anyone. Neither have I falsified to someone. I do not grease anyone, nor do I oil someone. Whatever I say, warm or cold, I do say it directly and face to face, and for a cause. Even when I was in the helm of GEFONT, I upheld it. I never treated my comrades discriminately, nor did I favour them clandestinely. I maintained equal respect to all and poured them with equal affection. However, ‘strictness’ was the working-style that I applied in the institutional governance of GEFONT and in leading the trade union movement. I did not distract from it. I was guided by the belief that fellow comrades would follow the agreed norms and procedures only when the leadership follows them in letter and spirit. I never let my tenacity falter. So, I persistently followed what was agreed and procedurally correct. While doing so, I might have chocked for myself to lead the team in the regulated milieu, while, other comrades might have suffocated to fit themselves in the given environment and discharge their duties. Nevertheless, if we had not done so, we would not have been where we are now. And, we would not be as organized and consolidated as we are today. From the very onset of my association with GEFONT, I gave a message — Rights must come with duties, Distribution must be based on production and Consumption must be backed by entrepreneurship. ‘Capital organises therefore labour must organise’ is what I learned and understood while leading and consolidating the trade union movement. I smiled in response. And, in the mean time, I remembered you all because it was possible to bring GEFONT to this stature because of the dream we cherished together. I recalled the pains and difficulties we endured; and, the hard work we accomplished. The moment reminded me of not only the robust GEFONT of the day which is standing tall on the fortress of solid physical facility, capable human resource and noticeable financial graph, but also the sorry condition of GEFONT in the past when it was deprived of even basic financial and physical facilities. I remembered our comrades who willfully donated their salary to GEFONT for six months to salvage it from scarcity, and readied themselves to work empty stomach. I recalled the incident when I provoked comrades to quit their job and join trade union movement as full-timers. I was reminded with the days when I fortified comrades to spend nights in playing deusi-bhailoin Tihar to generate fund for trade union rather than celebrating festivals together with their families at home. I evoked the days when I asked colleagues to go for wage-works and deposit the earning to GEFONT. I remembered the days when I asked colleagues to excavate black sand and utilize the wages they receive for trade union activities. I was reminded with the colleagues who toiled hard for GEFONT’s publications and spent winter nights rolling back in their own jacket to fight cold. One of them was Cde Som Rai who is in front of us here today. We sometimes cracked jokes to each other — nature has wisely made us ‘short’ so that we can fit our whole body inside our jacket; otherwise what a misfortune it would be for us in such cold nights if we were made as tall as Buddhi Acharya! We each had nothing more than a jacket to bout the freezing cold of those winter nights. Therefore, if anyone says GEFONT has got this tallness by the mystic power of a single individual, it will be a blunder. GEFONT is built by the sweat and tears that we all have paid. The achievements we have made are the results of our collective efforts. So, I feel proud of it and would like to duly appreciate and acknowledge your brave dedication and invaluable contribution. I am grateful to my comrades. I have spent my three decades in different positions of GEFONT. Of the days I have lived so far, I have spent two thirds with you, and it is exceptionally more time than what I have spent with my family. Work was my only focus and priority; therefore, I kept on chasing you for it every moment. I know, I have given long speeches focusing on the importance of eight-hour work, eight-hour rest and eight-hour recreation in the life of workers. I am also mindful that I have preached innumerable times before you about the importance of right balance between work and life, and advised you to always maintain it in your work and family life too. But in reality, I always dragged you to the work in such a manner that you often forgot whether the day was working day or off day. I myself, Comrade Som and Comrade Umesh are the living witness of it. We have not had our progress and achievements overnight. It has a long history. Colleagues associated with us after 1979 have offered their toil and sweat to create the towering figure of GEFONT. When I unfold the pages of history I turn nostalgic. I sometimes ask myself if I did right being so workaholic and making all comrades work like round the clock. But when I listen to my heart, it says — yes, nothing has gone wrong in toiling so hard! If we had taken a break in the time of construction, we would not have had these many achievements in the time of celebration. And, I feel my heart is telling me absolutely right. Spartacus is a historical character of slave uprising against Roman Republic. He is one of the characters I like. Though he was young by his age, he was respected like ‘father figure’ by the Gladiators. Listen, I am not comparing myself with Spartacus here. I never think myself as great as him. But what I am meaning to say here is I always received ‘father-like’ respect from my fellow comrades throughout the time I was with GEFONT. Thank you, Comrades – I feel proud of you. I owe you and extend my gratitude to you and all members through you. My experience has taught me that challenges are always associated with the tasks we shoulder. A leader who is not ready to face and digest the challenge cannot withstand in leadership. It is human nature that the wound of own pains harder than the wound of others. And, normally, human feeling undermines the pain of others. But If a leadership fails to make a balance between own and others, such leadership cannot survive long. If I reflect on my own, I cannot fail to recall three key incidents in my life to date. They are the incidents of July 23, 1993, April 01, 2010; June 23, 2010. The incident of July 23, 1993, brought an unusual turning point in my life. We were protesting the murder of people’s leader Madan Bhandari. We had called nationwide general strike for three conspicuous days (July 16-18) and called off it on July 19. Days were extremely busy, also to work out the protest plan next. I participated in the leadership training programme for Central Women Workers Department (of GEFONT) on 19thand 20thof the month. It had been quite many days since I spoke to my mother last. There were limited landline phones then and means of communication were not as easy as they are now. We were not armed with mobile phones as we are today. I somehow managed to speak to my mother in one fine morning of the training days. She asked me to go home once. I gladdened her saying that I would go home to see her soon. Trishuli, my home village, is well-known for rice, lentils and mango though these produces are yielding less these days. My son was small. Over phone, my mother told me that she had prepared all necessary things for her grandson (my son). She was waiting for me to see and send the things to Kathmandu for my boy. The condition of road to my home was wretched then. I had to spend more than four hours to make it through. I reached home in the afternoon – the next day of the training. As soon as I got off the bus, I saw my younger brother coming to bazaar. He was sobbing. I asked him where was he going and if everything was fine. His answer broke me down. He was going to a shop to buy a shroud to bury my mother’s dead body who died a while ago. My wish to see her alive remained unfulfilled. I reached home carrying the shroud. Her dead body was lying in the front yard. I looked at my relatives. Everyone was crying. I looked at my younger sister who was almost unconscious because of the loss of mother. My father was sulking next to my mother’s corpse. I forcefully controlled myself and tried to console others. I gave my last but tender touch to the face of my dead mother; controlled myself and prepared for her last-rite. This incident was one of the turning points in my life. May I reveal the truth before you, comrades? I never got a chance and time to spend a month continuously with my parents from the age when I was five. My mother used to say — ‘you never know the affection of parents to their progenies. But you will understand it when you become a father.’ These motherly words still buzz in my ears. I spent 17 days at home for the last-rite of my mother. And, perhaps, this was the longest time I spent at home ever. I am the only son of my parents. After the death of my mother, I sold everything, except land, I inherited from parents. I took my younger sister together with me to Kathmandu. My father wished to live some more days in home village. I could not go against his will. So, leaving him there for some time, I together with my family and sister started to live in Katmandu. Life started to move in its own routine. Never mind, though, I am not accenting this incident here as my ‘huge sacrifice’ to the trade union movement. Another incident took place in April 01, 2010. I was in a party of holy-thread wearing ceremony of the son of Comrade Bidur Karki, the incumbent vice-president of GEFONT, who then was the vice-president of the Independent Transport Workers Association of Nepal. After a while I reached the party, I got a call from my home village. The call was to ask me to go home as soon as possible because my father was seriously ill. It worried me. I came out of the party hall and called my brother-in-law (husband of my elder sister) to crosscheck whether the case was that critical. He tried to hide me something but gave a message that I had to bring my spouse together to home. He added whatever busy I was I should run immediately. It sent chills down my spine. Message was clear if I ‘read’ between the lines. My father was no more. I rushed to home. When I reached there, I saw my father’s body lying in the front yard like my mother’s corpse 16 years back. The difference this time was that my political stature was elevated and all my relatives, the villagers and well-wishers were waiting for me. The third incident took place in June 23, 2010 when I was in Vancouver, Canada to participate the Second International Congress of ITUC. When I was preparing to take floor in the Congress, I got a text message from my spouse. The message read — don’t worry, daughter Smriti has undergone a successful appendicitis operation. It was really a sorry moment for me for not being with her in such needed time. I turned pale and helpless, but somehow gathered myself, picked-up the microphone and addressed the Congress. All that happened after my speech was that most of the known persons present in the Congress thanked me and appreciated the issues I highlighted in my deliberation. But you all can imagine how I addressed the Congress and what was the state of my mind in the aftermath of the message I read from home. It is not only me who have gone through such pains in life. Many comrades have frequented such situations in their life. The latest incident I am sharing with you now is about our driver Dinesh Magar. It was 15 days back when I together with the Prime Minister was in the Division Head Quarter of Nepal Army in Surkhet. Dinesh received a call from home and that said —- his father slipped and fell down; he was seriously injured so Dinesh had to go home soon possible. Immediately, Dinesh came to me and asked if he could go home. It was a serious matter and he could go without asking me. I told him to go instantly but he was worried about who would pick me from the airport to the office if he went home. I was moved by his generosity and honesty towards his duty. His decency touched me deep. His father wanted to meet and see the faces of his children in the last minute of his life. But he could not survive until Dinesh reached home. Father died untimely at the age of 53. It was really a sorry moment for Dinesh and all us. This is us, Comrade! Every one of us has witnessed and faced similar painful situation. However, we have endured every pain we faced and we have risen up every time we fell. In every difficult situation, we have stood together and we have stood tall. This grand institution, GEFONT, is the result of our collective sacrifice, devotion and martyrdom. This is the institution we have made! My experience says, a whole generation sacrifices to build an institution. Therefore, fellow generation must be open to acknowledge and adore the sacrifice, dedication and martyrdom of the foregoing generation. Competition in the time of National Congress of any organisation like GEFONT for the leadership position is a normal process. Competition takes place normally among those who think themselves are qualified and competent. Whoever wins will be the leader. And, those who do not win should wait for the next time. This is the established norm. It does not sound logical if those who cannot make this time start making discounted comments and feeling depressed. Such attitude does not look healthy even for those who display it. It is said — “If you want something you’ve never had, you have to do something you’ve never done.”Therefore, whether you do not go for a competition, else, be ready to accept the result whatever it comes to you. Having said this, I remind you all that the trade union movement cannot make a stride carrying the baggage of jealousy, envy, criticism, despair and abnormal personality traits. Us trade unionists, who have been part of the movement that is directly related to the life of working class, must be concerned about the future of working class. Therefore, before we think of our management and respectful position in the rank and file, we must think of their situation and their confidence on us. Our minor mistake should not wane our struggle; it should not shatter the hope of working class. Even in my context, I am not more than a simple citizen — Bishnu Rimal. I am not a magical person. If I have been able to make some contribution to build and raise profile of GEFONT in the last 30 years, I feel proud of it. And, I always feel thankful to you all for your support and generosity. But, if you feel my three decades in GEFONT have gone unnoticed and without making headway, forgive me. The days to come are waiting for your decent leadership. Lead the days ahead. Do good. My wishes are with you. Never mind if my emotions are mixed with my deliberations today. My entry to GEFONT was not pre-planned. It was a sudden entrance. Two of the comrades who encouraged me to jump into the helm of trade union movement, Comrade Ishwar Pokhrel and Comrade Mukunda Neupane are with us today. Along with them was Comrade Pradip Nepal, leader of then CPN (ML). Though he is not here in this hall now, he was one of them who brought me to this movement. I was teaching at Institute of Engineering, Pulchowk-Lalitpur. I had submitted my time and income to my political party. I had to do nothing to my parents to manage their living. There was no problem for livelihood. Sometimes I have heard irritating word of some comrades worrying about the hand-to-mouth problems. I have told them — I have not joined politics for two meals of the day. I, instead, have joined politics giving up my all-comfortable meals of the day. I am not boasting about it. This is my reality. It was the year when Tribhuwan University was planning elections of Free Student Union. Those days election of free students’ union was considered as of general election. I was associated with the Valley Committee of then underground political party and was pursuing my Master’s Degree in economics. I was asked if I were interested to contest the election for the president of Free Students Union in TU Central Campus, Kirtipur. I said no to join the student politics. Comrade Pradip Nepal said — if you are not interested in student politics, join the trade union (Nepal Independent Workers Union) and work in this sector. I did not say no! I accepted the new responsibility and started to work accordingly. 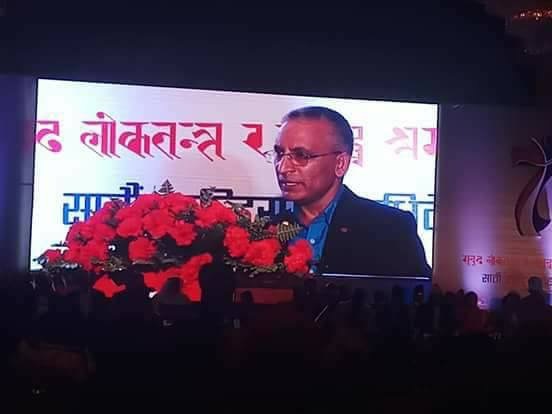 Comrade Shankar Pokharel, the Chief Minister of Province – 5 now, contested the election in TU and established himself as the popular president of student union. This way, I have changed track in my political carrier. I wanted to do something new and devoted myself to establish GEFONT. But some comrades did not digest my entrance to this sector. It was because of the schooling they belonged to. They used to think trade union is the organization of coolies and garbage collectors, and ‘white-collar workers cannot fit to this sector. It was completely a wrong viewpoint of the comrades. We were mobilised by the party. And, whatever direction used to come to us, we would follow it. We started to visit communities and reached to the workplace carrying bags in our shoulders. Some comrades nicknamed us ‘bag bearers’ – might be to insult us or to recognize us by our profession! Whatever was the motif; we took it easy and devoted ourselves to nurture GEFONT. The result is — the organisation has been the leading institution of the trade union movement in Nepal. There are some simple but important practices we have introduced for our integrity. I feel it will be a good even for the upcoming leadership if they continue to follow it. For example, it was like a dream for many of us to fly abroad in the airplane and participate in international events. But it has been common for us to travel by airplane now. It may not sound soothing to take names here, but I feel proud to share here that it was us who made possible the dream of many senior comrades today to fly abroad in the airplane. Meantime, I also started to prepare the list for a record. I think the number of comrades who have travelled abroad for the first time via GEFONT crosses thousand now. It was like a regular practice to go to the airport to see off those who were going abroad. There was nothing wrong in doing so. But the unusual part of it was that such ‘see off’ decorated with flowers and garlands were offered only those who were in senior portfolio. Those who were ‘junior’ and needed support on ‘check in’ procedures and other airport protocols were left alone. Therefore, we broke the tradition and introduced a new practice to farewell all at the GEFONT’s executive hall. We also started to orient them on the procedures and protocols to be followed in the airport and brief them about the programmes they were attending abroad. It continues even today. At the end of the farewell event, Secretary Generalof GEFONT extends felicitations and wishes a safe journey to the travellers. Upon return, the comrades bring chocolate as ‘gift’ and share experience of the event they attended among the colleagues at office. Another practice we have brought to implementation is that the comrades have to give certain amount of the savings of their DSA to the organisation. And, probably, it must be the GEFONT where the comrades deposit 70% of the savings of their DSA in its accounts. They take 30% of it to buy gifts for their children and families. It is the practice started in my tenure. It has been normal for us now to go to the star hotel and dine there. But it was like folklore 20/25 years back. In 1993, a team of brick-kilns workers were taken to Hotel Soaltee for a study tour as part of their nine-month basic training programme. While coming out of the hotel, I asked them about their feeling. They replied they would work free of cost if they got a chance to work in such a nice hotel. Startled as I was, I thought they saw only the flamboyant decoration of the hotel but did not understand the troubles of workers there where the hotel management terminated them from their job for the reason that they did not shave their beard clean. GEFONT is credited for a symbol of competition and mutual respect. Competition at GEFONT is not a drama to perform for others, nor is it to get appreciation from others. ‘Competition’ has been an inbuilt culture of GEFONT life. We have established that we believe in collective decisions and zero hierarchy in positions. There is no one superior and nobody is inferior in the organisation. No one thinks where I would be (in the position) but everyone thinks what would be our collective mission! If we establish a system to govern the organisation, the system creates space for all to accommodate. No one will be out of the ring if things are guided by it. I feel we have established the system to guide us to course the organisation, and, I think, no comrades have any dissent against it. We all have confidence at GEFONT that — if we stand in a queue, we reach to the top. And, it is in the queue where we can screen ‘right person for right place to get impressive results! I wish you could continue the practice in the days to come too that the queue begins from the point where GEFONT stands. We need to be creative too. I do not take much time to elaborate what we mean by creativity. We all know about our priority and the modality to accomplish it. But I add, the struggle that we have to wage now is the ‘struggle in democracy’ — in past, we were waging ‘struggle for democracy’. The context has changed and so must we. Please be mindful of it. There are some dimensions of our tasks ahead. We have recurrently said that if someone wants to understand us, they have to see us through our eyes. They have to do so to understand our world of work at the least. Otherwise, their worldview creates misleading impression of reality of us. We have had a good success on our call in this. I request the new leadership to stand firm on it. I turned speechless and quietly spoke to myself — wisdom never grows old, what we see even in the age is how ingeniously the wisdom is used! As the context of the Soviet Union has come to my deliberation, let me share with you a hearsay about Stalin and Khrushchev. Both leaders were very popular in the country. While Stalin was a leader with strong personality, Khrushchev was liberal. Khrushchev never went against Stalin. He always agreed with what Stalin came up with. He was like ‘yes man’. But after Stalin’s death, it was Khrushchev who criticized him sharply. In a meeting of the party, Khrushchev said Stalin was a dictator and he never let anyone in the Party Committee to speak. After listening the sharp comment of Khrushchev, one of the participants in the meeting asked – Comrade, you were like a ‘yes-man’ of Stalin until the day he died. You were in his team. But we never heard you saying anything against Stalin when he was alive. If you had these many issues and complains to attach him, why did you stay mum in the committee? Why did not you oppose him if he was doing wrong. Why did not you advise him measures to right the wrong? Just a while ago, in front of us, the immediate past Secretary General of our confederation heavily came down on the outgoing leadership. He was supposed to welcome the newly elected leadership but dwelling less on his task, he spent more time in criticism. I have nothing more to say than this — ‘Was I, Bishnu Rimal, like Stalin who kept everything under his control?’ The good gesture Khrushchev showed at least was he opened his mouth against Stalin only after his death. But my mate, junior to me, has come down on me so heavily even when I am alive and still with you. My humble request — If I imposed dictatorship while working with you and if I oppressed you or banned you to speak out, please speak now, you are free. Or, if removing my photo from the wall of GEFONT pacify you, please do that. Even if you do so, I will be close to you. I will be with you and I will be living in Nepal among you. This is my commitment to you. However, I opt for a free advice to you — if you wish to spit, please do not do that looking at the sky. It falls down on your face and makes your own face dirty! Just a while ago, Binod Shrestha, the newly elected president of GEFONT, spoke a lot about me. He highlighted the good works I led, presented me with an invaluable souvenir, and gave his deliberations that touched my heart. Thank you Comrade Binod! My unbounding love to my daughter Smriti who has gone through severe difficulties because of my absence in the time she needed — I am so sorry darling! I am confident that my successor in GEFONT is very strong. I am very happy that I have been able to handover the leadership to a strong team. I am hopeful this team will be able to make a more quality achievement than what my team has achieved. You gave me your respect. You regarded me as you leader. Now you have made me the patron of this organization — my gratitude is with you all. I am with you and I will together with you always. If I have made any mistakes unknowingly, forgive me.